I ended the club championship with two walkover wins. This was a fairly disapointing conclusion to the league for me. I'm going to drop rating points as I lost my games against higher rated opponents earlier in the league but never got the chance to earn them back by facing players at my own level. I'm not sure what can be done to solve the walkover issue but I win about 20% of my games in the league via them which is way too high. Munster League Division 1. Rounds 12 and 13. Relegation Dogfight. A tense day in the Munster Leagues as the relegation battle came to a head. We were behind Limerick B going into our head to head match and needed a win to boost our hopes of staying up. In the end we did win our match 3.5 to 1.5. I had a somewhat fortunate win in my game. I think I was worse after the opening and my opponent was starting to get an attack going on my king. However I managed to get an outside passed h pawn and that proved to be my saviour as it gave me counterplay. Without that I would have been in serious trouble and I'm not sure I could have won. That gave us some breathing room over Limerick B. Our next game was against Limerick A and a result here would have put us clear. 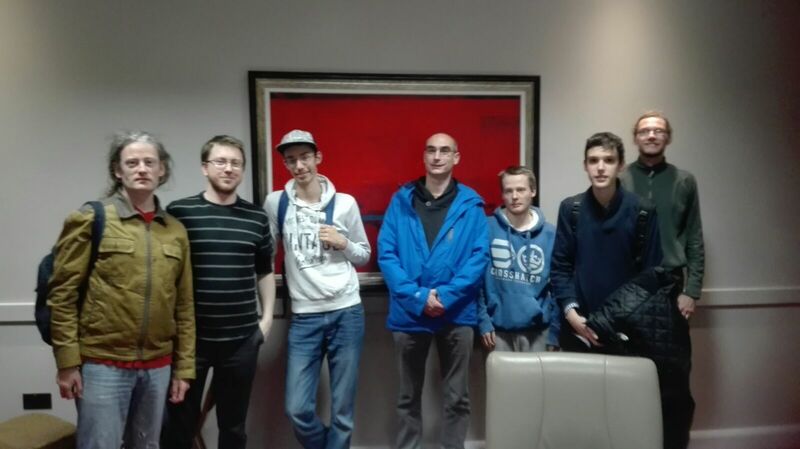 Unfortunately we lost that match. I had a shocker in my game. I was well up and about to pick up the exchange. However I played a careless pawn move, my opponent made a knight jump which I hadn't seen and then I panicked and collapsed. If Limerick B got a result against CCYMS, we would have been in big trouble. That match came down to the final game but luckily for us CCYMS came through. So going into the final day we are half a point ahead of Limerick B and need to match their result to stay up. 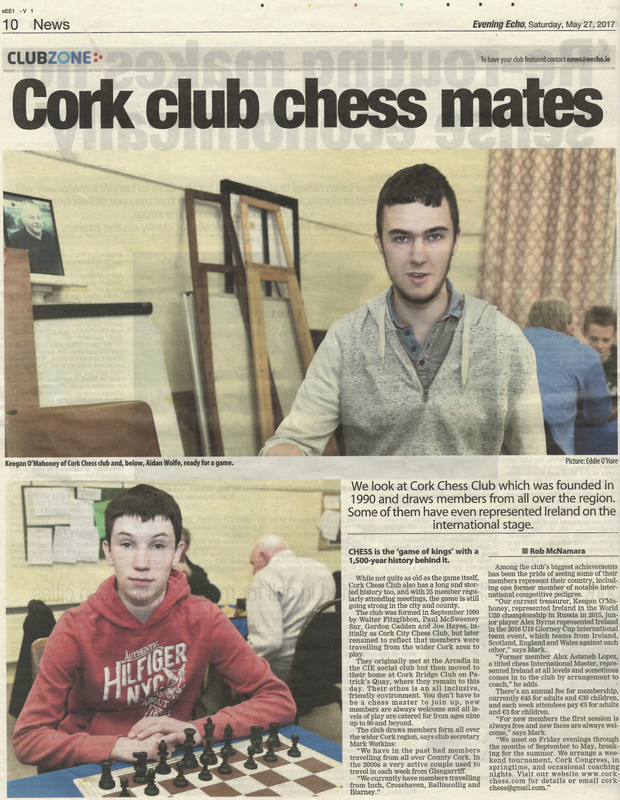 The Cork Congress happened over the weekend of 29th-31st March and I didn't do too bad in it. I finished third in my section and got some cash for my troubles! The event was very well organised - great credit must go to those at the club who ran the tournament. Thankfully this year didn't coincide with the clocks changing but it did share the hotel with a Fawlty Towers show! It's a bit sureal to be playing the game and hearing Basil's German speech coming from the adjacent room. At times during my games I wished I was in that show rather than at the chess board! My first game was a long draw. I got an ok position as black in the QGD but then lost the plot a bit and got into some trouble. I managed to get into a rook endgame where both of us were threatening to promote. I picked up an extra pawn here at this stage but when things simplified it was into a theoretically drawn position. I could and probably should have played on here but my brain was frazzled and I was down to a couple of minutes. My opponent had offered a draw and I accepted. One of my problems here is that I know the position is a draw but I'm not sure what to try to do to complicate it and win. In future if I have this position, I think I would play it until the pawn endgame and see what happens. I was paired against an unrated opponent in the next round so I had no idea of how strong he was. It was a crazy game. He attacked on the kingside and I on the queenside. I held him off and I think I had a good position before it all went to pieces in mutual time trouble. I missed a win with Nxc6 - I managed to miscalculate this both during the game and also in the post mortem. He managed to get a pawn on f3 and with the way my pawns were arranged I realised I had serious back rank issues. Thankfully he missed some critical moves and I managed to get a win when he blundered his rook. The next round had me as black against the French Exchange. I always think that this is the variation to go for as white as the pawn structures and positions are completely different to the other French variations. I've had good results though with it but I'd struggle to find a coherent plan or common thread in my Exchange games. I equalised fairly easily in this game but wasn't sure where to go from there. I had a bye booked for the fourth round so when my opponent offered a draw and I didn't see much of a plan I took the opportunity to knock off early for the day. The idea was to come back more refreshed the next day and try again. Realistically this bye and the two draws put me out of contention for the top prize from early on but I was enjoying myself playing at this more relaxed pace. The first game on the Sunday morning was another King's Indian game. I tend to lump these in with the Dutch and various kingside fianchetto games as they all seem to end up in similar positions. I think I'm learning in these positions. Up to now I tended to mess around on the queenside too much with unnecessary preparation moves. This time I just went for it with the attitude that if he survived my attack and countered then fine - but at least I'd get an attack in first. This worked out well for me and I won an exchange just out of the opening. I slowly increased the pressure and managed to convert the win. I may have had an easier win on move 26 with Bxf7 Qxf7, Nxe5 Bxe5, Rd8+ getting the piece back and gaining a pawn. I was worried that my rook may find it hard to get back out but going over this after the game I think it would have been fine. I went for the more solid option and eventually my opponent flagged in a lost position. My last game in the tournament was one in which I was fortunate to get a win. I thought I was winning a piece after the opening but in reality it just forced him into playing it as a sacrificial attack! I had to give back the piece to survive. I think I took my longest think ever for a move on Qc7 - about 30 mins. My opponent waited a bit, went away, got a coffee, came back and still had to wait for another 10 minutes. I was thinking that I was in trouble during the game but on the computer I'm perfectly fine. I have great trouble evaluating these kinds of positions. In the endgame I think he should have tried to keep on both rooks as that would have been far more drawish. 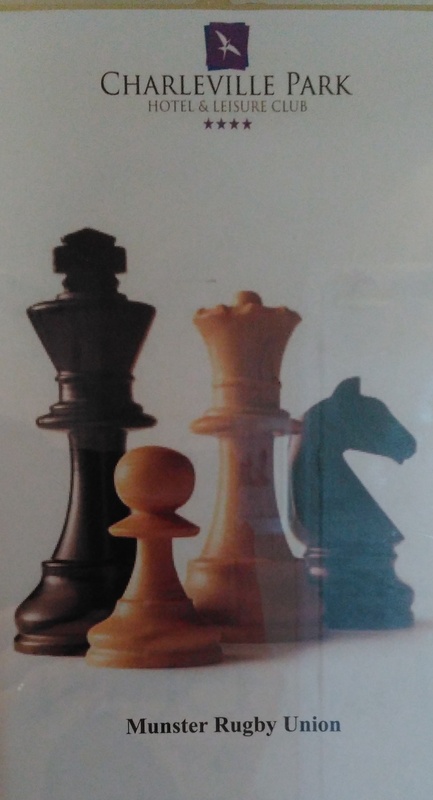 Once I won a pawn and traded off the rooks, the King and pawn endgame was always going to be good for me and eventually I queened and won the game. In the end I won a prize for joint third place in my section. I even gained a few rating points! All in all a good tournament for me. Munster League Division 1. Rounds 10 and 11. This was a bad day for us in the Munster League. We lost both our matches to Adare and Limerick B. The Limerick B match was especially bad as they now leapfrogged over us in the table. I was close to getting a draw against a much higher opponent in my first game but lost a crucial pawn in the endgame and went down from there. The second game was a disaster for me. I got a slightly better position going into the endgame - my opponent had an isolated pawn - but then I lost a piece to a pawn fork and with it, the game. 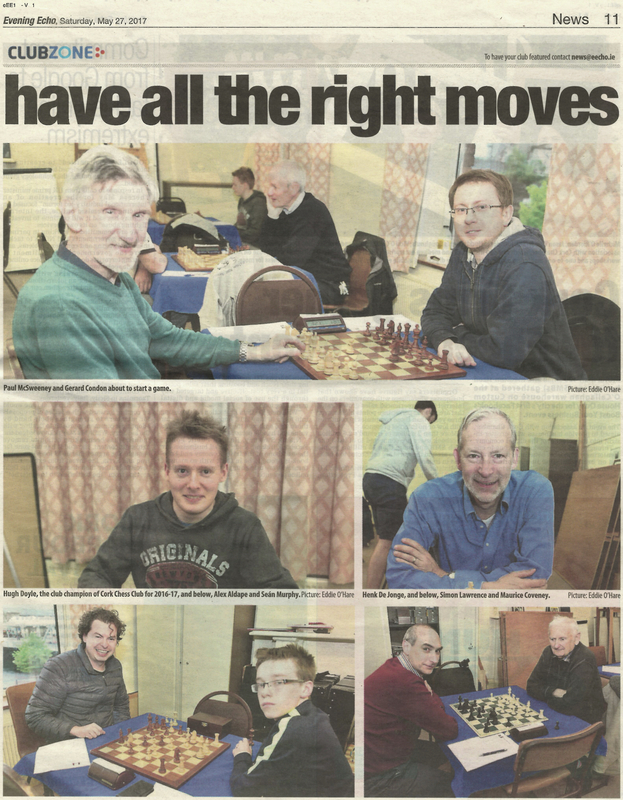 On a more amusing note, the Munster Chess Union got a little confused as to what game we were playing. We'd probably have had a better chance in the rugby! The club championship continued and I also continued my streak of losing to higher rated players. I had a chance to get a great position early in the opening with 9. Ng5. I looked at it, thought it was good and was going to play it. Then however I thought I would take a deeper look, completely miscalculated and convinced myself the move was bad. If I was a worse or better player I would have played the move. Unfortunately I had just enough knowledge and skill to make a complete mess of things. After that my opponent got a great attack against my kingside and finished it off nicely. I still think I'm messing about with less active moves in these positions and should be more direct on the queenside in future.